THE CHOSEN ONE | Watchman - Declare What You See! On Thursday, May, 4, 2006, an article appeared in the local newspaper, via The Associated Press, that immediately captured my attention due to the unbelievable content found therein. Feeling that the article might well have “spiritual implications” for the future, it was put aside until a recent major news event prompted me to read it once again. Before I reveal the entire article and all the things that have since come to light in relation to it, I’m only going to give you a tidbit of information to “chew on” in order not to induce “information overload”. We are living in “strange times” as the very essence of everything previously considered “stable” appears to be falling into ruin, sin, or depravity! The hour is fast approaching when the Son of Perdition will be revealed to the world in all his glory. Whoever this individual turns out to be will be a total and unexpected surprise to most everyone, even those who follow Bible prophesy and world events. (He) “will do more than any other man in history to change the course of humanity”. If you have read The Lucifer Project – Raising Antichrist from the beginning, then much of what you will read in this article and the meaning of the number 33 will already be very apparent in the grand scheme of things. Here’s a brief refresher on the number 33. It represents the death of Christ at age 33, and it represents the false messiah and the probable time of his appearance on 12/21/2012, as it will be 33 years from the year of the election of the first U. S. President to take the “Oath of Office” while facing the Phallus of Baal. This very act before the world called for the “resurrection” of Osiris’ son, Horus, which most simply call the Antichrist. For the full meaning and ramifications of the number 33, please read my previous blog entries found in the archives. In summary, Jesus Christ was put to death on the cross at the age of 33, and at the age of 33 this “mystery son” spoken of above has also suffered a “death” of sorts that reeks of a “counterfeit” of the real thing – the death of THE CHOSEN ONE! This mystery son believes in reincarnation, so he would accept the theory that he has had previous lives, and that he will continue or has continued to be reincarnated until the level of PERFECTION is attained which is represented in the number 33 ( 3 x 3 = 9). As previously shown, this is where the state of nirvana has been found and the “gods return”. Much of the history making events are covered in videos which are readily available on the internet in today’s world, so little of any importance escapes inquiring minds. In light of recent events, you might find the following videos to be of interest regarding the topic of this article. Some of you readers have probably already guessed by now, especially after watching the YouTube videos above who this mystery son I’ve been talking about really is. What struck me as a “spiritual significant” event in May of 2006 when the article on the mystery son first appeared, once again got my full attention in recent days. It seems that I’m not the only “Watchman” who sees things of “spiritual significance” occurring in these recent events and in the Photoshop “make-up” of two of the most prominent and well-known men on earth. That is, they are well-known as public figures, but their private lives have been and still are mostly a much guarded secret. After deciding to bring out this information via a blog article, I found another Watchman who has also written on this subject and in much detail. Therefore, I will refer you to the articles that he has written in order to bring you “up to speed” on the issues at hand. 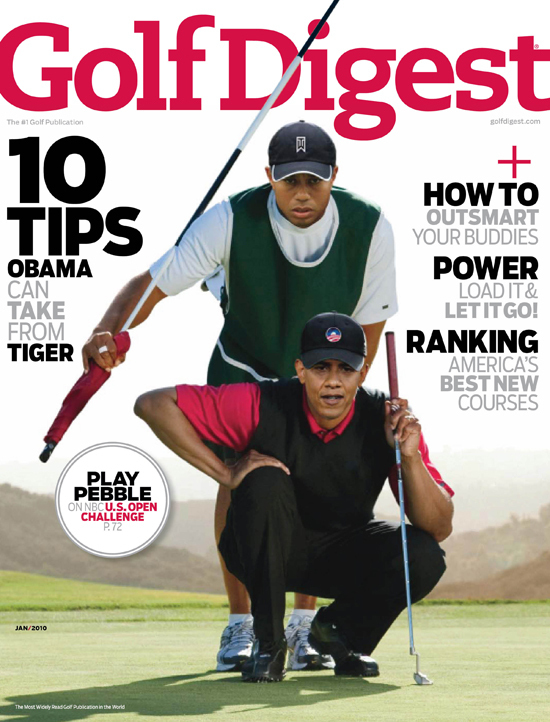 Here’s the link to the full article from which I got my first “insight” in May of 2006 and the cover of the January 2010 issue of Golf Digest. You will find the things written by the other Watchman regarding the things that the cover of this issue could be implying to be mind-blowing! Since I have a copy of the original AP article, I used it to find the full article on the web and noticed that it was posted by a fireman on May 3, 2006, the day Tiger’s father, Earl Woods, passed away. Here are a couple more links for any who wish to brush up a little on some quick information and actions on record as historical fact. This could also allude to many – plural- false ones arising. There have already been quite a few in history but perhaps as we near the end of the age this will ramp up even more so. Right now it looks like quite a few minnows are swimming up the same stream until eventually the big kahuna takes over.